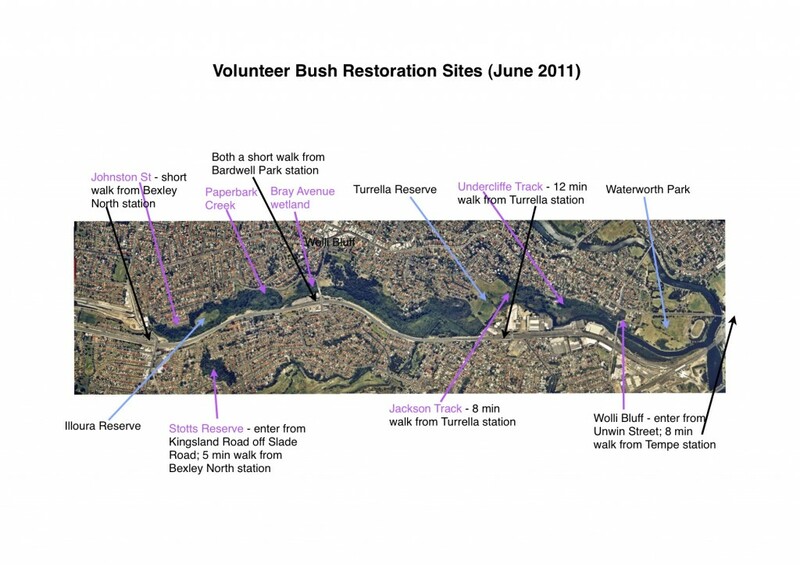 The Wolli Creek Preservation Society carries out bush restoration at many sites in the Wolli Creek area (see map and current regular dates) with the support of state government grants and Canterbury and Rockdale City Councils. These activities are primarily within the areas of the developing Wolli Creek Regional Park that are yet to come under the ownership of the National Parks and Wildlife Service, i.e. between Bexley North and Bardwell Park and between Turrella and Tempe. We generally work from 9-12.30 (8-11.30 during daylight saving months), under the supervision of an experienced professional bush regenerator. 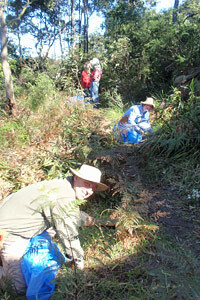 There are also occasional ‘guerrilla bushcare’ sessions for special tasks/needs. These usually last only a couple of hours and include occasional planting days. If you are interested in joining any of these activities please email the Bushcare co-ordinator bushcare@wollicreek.org.au and provide your phone and email contact details. Details about registration, the nature of the work and meeting places etc can then be provided to you. If you have time available, we are sure you’ll find you one or more occasions that fit your timetable. Come along and try it out before you make any commitment, but bushcare provides a rewarding and sociable time (especially at morning tea!). Prior experience is not necessary and we put on a training day for volunteers from time to time, but most basic things can be learnt ‘on the job’. If you have questions before you register, email our Bushcare co-ordinator bushcare@wollicreek.org.au We need you to be on our volunteer list as sometimes the weather and other contingencies require late changes to regular arrangements. We like to work each site with the combination of a team of professional bush regenerators and a regular group of volunteers, supervised by a well-experienced bush regenerator. This is often the supervisor of the professional team, so that someone has a good overall picture of the priorities for work. Sometimes, if the nature of the work allows it, we are able to make use of volunteer labour from corporate employees. We rely on support from our local Council (Canterbury) in disposing of weeds and rubbish removed from bushland. Professional teams cost money and so to employ them we are generally dependent on obtaining grants (each site needs $20,000+ per year and supervision of volunteers takes $2,000+) and for effective work and medium-term planning we prefer multi-year grants. These are awarded on a competitive basis and are often quite demanding in terms of both application-writing and reporting. Sometimes, often thanks to generous donations, we are able to maintain paid volunteer supervision even when we are unsuccessful in gaining grants, but of course we can make rather less headway with only our volunteer team. Other recent improvements to the bush and creek have involved controlling and treating stormwater run –off from surrounding streets. In the past, such stormwater coming from many street drains was often channelled to the nearest bushland and then that’s where the pipe ended. This strong flow, then spread out, eroded some areas, built up silt and rubbish elsewhere and brought many nutrients into the bush. As a result, most water channels below the outlets were a tangled mess of rubbish and many weeds, encouraged by the water and nutrient supply. Canterbury Council has installed ‘pit traps’ at a number of entry points to stormwater pipes to catch large-sized rubbish. The Cooks River Urban Water Initiative (CRUWI 2008-11) was a $2m Commonwealth program initiated by then local MPs (Albanese, Burke, McClelland, Murphy), administered by The Sydney Metro Catchment Management Authority, and contracted by local Councils in the Cooks River catchment; under it, a number of different water treatment devices were installed in the Wolli Valley (see CRUWI projects listed below). 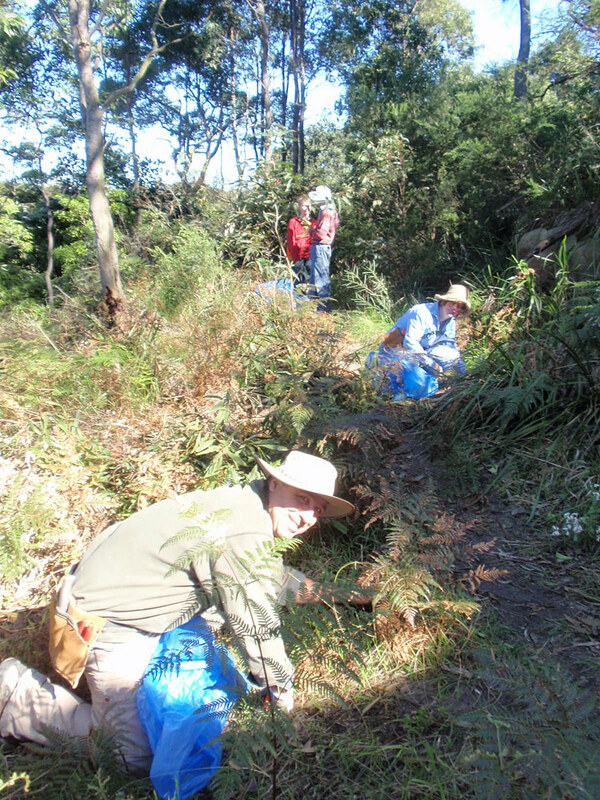 WCPS volunteers undertake small-scale modifications to some channels to manage the passage of water through bush restoration sites. We also, on an informal basis, monitor the performance of the water treatment devices. Johnston St. – 2011 construction of a bio-retention basin (slows down water flow, removes silt and nutrients from low-flow rain events). A CRUWI project. S J Harrison Reserve – 2010 (the outlet is into Blackbutt Creek below). A large-scale installation of exfiltration pipes to slow flows and filter water. A CRUWI project. Paperbark Creek – 2007 Restructuring of the initial creekline below the outlet (taken down to bedrock, sides armoured with sandstone.) A Canterbury City Council project under a Commonwealth grant. This was severely disrupted by flood in October 2014 and in need of major work at January 2015. Bray Ave. – 2006 Restructuring of short channel into wetland under joint funding from Canterbury Council and the State Government’s Cooks River Foreshore Improvement Plan. 2009 Installation of a Gross Pollutant Trap (GPT) above the restructured channel. A CRUWI project. Fauna St. – 2009 Reconstruction of stormwater flow to creek through bio-retention swales in adjacent grassed area. Bardwell Creek – 2009 installation of two GPTs and a reconstructed wetland to treat stormwater entering Wolli’s main tributary. A CRUWI project. Turrella Reserve – 2010 Installation a very large GPT below the lawns to remove rubbish and some silt from large stormwater catchment before it enters Turrella Creek. Highcliff Road – 2009 Installation of GPT at W end of road to remove rubbish from water flow. A CRUWI project. Channel below extensively re-organised by NPWS. 2011 Construction of a roadside ‘rain garden’ (a planted swale) at the E end of road to capture, filter and remove nutrients from stormwater channel. A CRUWI project. Undercliffe Track – 2011 Realignment and armouring of initial channel below the rain garden outlet from Highcliff Road. Arranged by WCPS with Sydney Water and their contractors as part of sewer re-lining. Container deposit legislation. WCPS has been supporting the national campaign, backing up the front-line efforts of the Cooks River Valley Association and the Total Environment Centre. A post-flood event (October 2014) clean-up at Bray Avenue has shown just how high a proportion of floating rubbish is made up of drink containers. Community education about the dropping of litter. We need everyone to recognise that streets, shopping centres and car parks etc are actually the modern headwaters of Wolli Creek and so to not throw /drop rubbish into them. Community education about the garden plants that ‘jump the fence’ and become problems in bushland (garden escapees account for about 70% of the weed species found in Wolli bushland), and where acceptable, their replacement with local natives that will help support local wildlife (some of these native plants can be purchased from Marrickville Council’s Community Nursery). Dumping – some residents and some tradies think that bushland is just the place to put garden clippings or leftover trade waste etc. Vandalism – other people think it’s OK to rip out or chop off plants, or remove bush rock. We need everyone to keep an eye on what happens in the Valley and to report bad things to the relevant authorities (NPWS 9337 5511; Canterbury Council 9789 9300; Rockdale Council 9562 1666 Ashfield Police 9797 4099; St George Police 8566 7499; Police Assistance Line 131 444; Sydney Water 132 090; EPA Enviroline 131 555). Please also notify WCPS. WCPS also has available a credit card sized contact card with these authorities contact details on it – handy to keep in the wallet.